“Jab Tak Hai Jaan” Starring Shahrukh Khan, Katrina Kaif, Anushka Sharma, Rishi Kapoor, Anupam Kher, Neetu Singh; directed by Yash Chopra; music by A. R. Rahman. This is the final love story from illustrious director Yash Chopra who recently passed away just weeks after announcing his retirement from moviemaking. Chopra made some of Indian cinema's most memorable films through the years, including “Waqt,” “Daag,” “Deewar,” “Kabhi Kabhie,” “Silsila,” “Chandni,” “Lahme” and Veer-Zaara. Reportedly, Chopra called this movie “an emotional film … not comedy, action, escapism … only three characters and their emotions.” Set to release on Diwali, many details of the plot have not been made public. Yash-Raj favorite, Shahrukh Khan stars as Samar Anand. His role spans two ages, one in his late 20s, as a musician based in London and later on as a reserved, dutiful army officer in Kashmir. Katrina Kaif is paired with Khan for the first time as Meera. Anushka is Akira, a young girl who wants to work for the Discovery Channel and make documentaries. She is extremely ambitious and would do anything to make it big and realize her dreams. Filming took place in London and Kashmir. Expectations are high with music composed by A.R. Rahman and lyrics by Gulzar. “Talaash” Starring Aamir Khan, Rani Mukherji, Kareena Kapoor, Shernaz Patel, Raj Kumar Yadav, Nawazuddin Siddiqui; directed by Reema Kagti; music by Ram Sampath. It’s been two years since we’ve seen Aamir Khan on the big screen in “Mumbai Diaries.” He was then busy hosting the highly acclaimed television show “Satyamev Jayate.” With the much- anticipated release of this suspense thriller, the wait is over for his multitude of fans, me included. 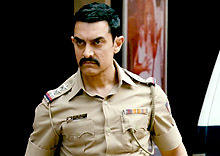 Aamir Khan plays the stern Inspector Surjan Singh Shekhawat. He is assigned to investigate a high-profile case, the death of a popular film star whose car plunged into the waters. There seem to be no clues and many questions. To uncover the truth in this complex case, he must determine whether it was an accident or a crime. Shekhawat is forced to confront the demons of his own past in his efforts to solve what appears to be a perfect crime. Rani Mukherj plays wife, Sunaina, who has suspicions about her husband’s whereabouts. Kareena Kapoor is the mysterious Rosy, who says she can help him. They are linked together by their entanglement in this mystery. Shooting took place in Mumbai, Pondicherry and London. The story and screenplay is co-written by Zoya Akhtar and director Reema Kagti.